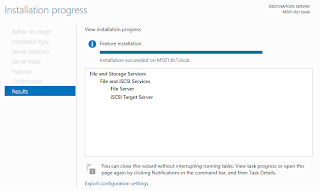 I would like to install and test Multipath I/O (MPIO) for iSCSI connection. 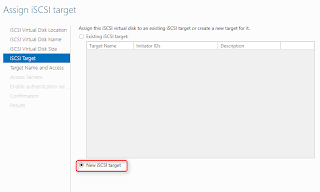 After enabling MPIO for iSCSI connection, we can use all or selected NICs to connect iSCSI target. 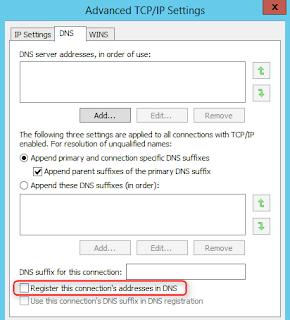 MPIO can utilize all NICs to transfer data to same destination and then it supports error handling, failover and recovery function by Device-Specific Modules (DSM). 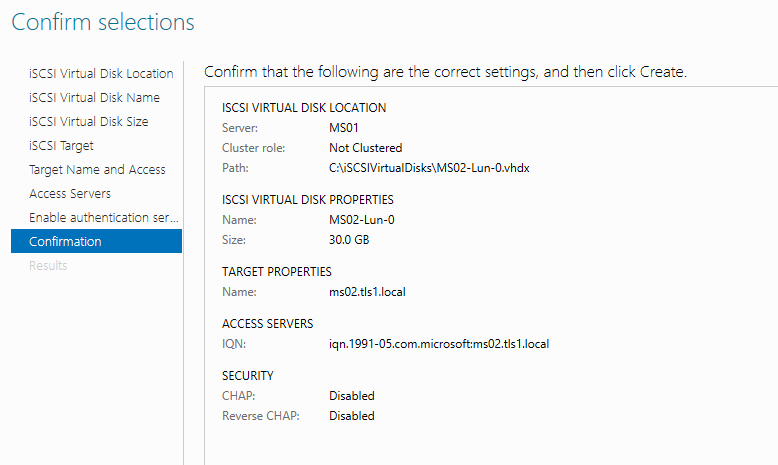 By default, the Microsoft DSM is available in Windows Server 2012 and Windows Server 2012 R2. Microsoft provided the more detail information about MPIO, please read the following web site for your information. 1. 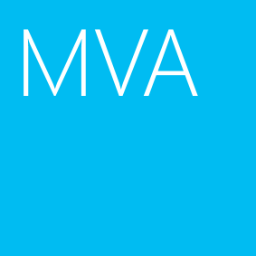 On MS01, log in as Domain Administrator. 3. On "Server Manager", click "Add roles and features". 4. On "Before You Begin" window, click "Next". 5. On "Installation Type" window, select "Role-based or feature-based installation". 7. 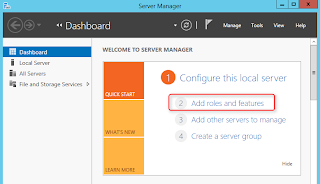 On "Server Selection" window, click "Next". 8. On "Server Roles" window, check "iSCSI Target Server" and then click "Add Features". 10. On "Confirmation" window, click "Install". 11. On "Results" window, click "Close". 12. 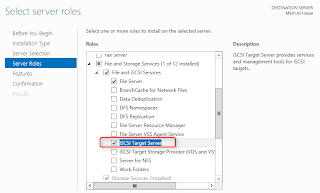 On "Server Manager" window, select "File and Storage Services". 14. 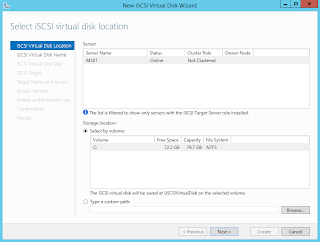 Click "To create an iSCSI virtual disk, start the New iSCSI Virtual Disk Wizard". 15. 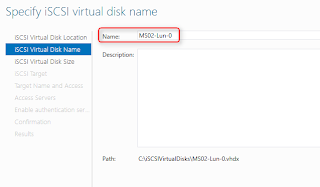 On "iSCSI Virtual Disk Location" window, click "Next". 16. On "iSCSI Virtual Disk Name" window, next to "Name", enter "MS02-Lun-0". 18. 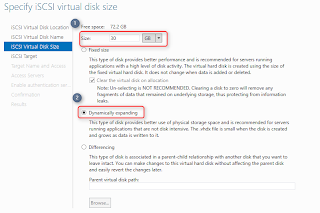 On "iSCSI Virtual Disk Size" window, next to "Size", enter "30". 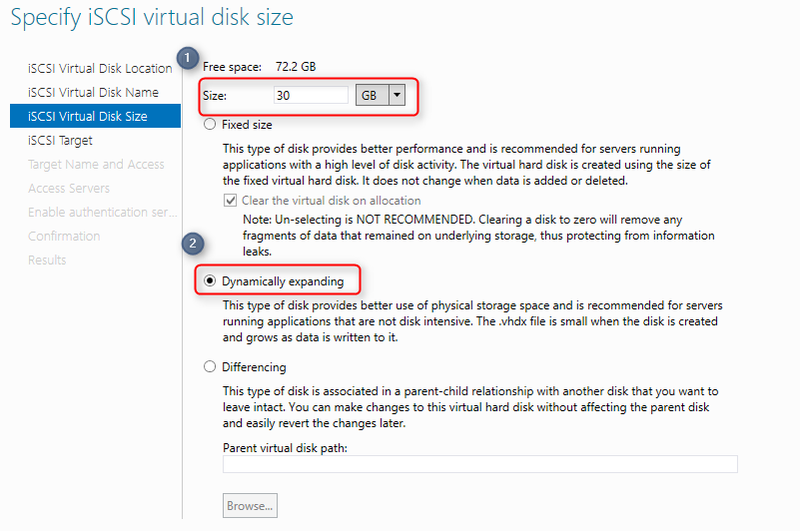 Remark: In Windows Server 2012, there is no option to select the types of VHD. In Windows Server 2012 R2, the virtual hard disk format of iSCSI target is VHDX. 21. 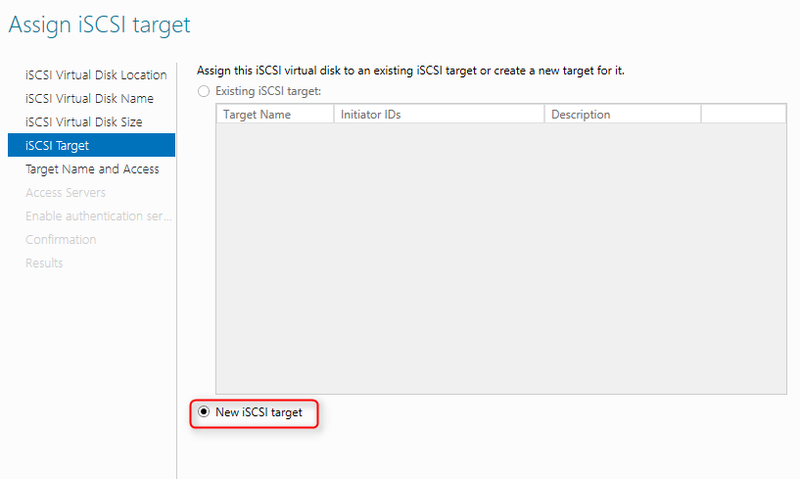 On "iSCSI Target" window, select "New iSCSI target", click "Next". 22. 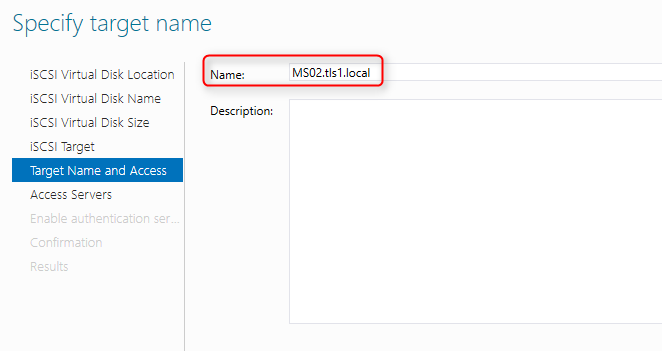 On "Target Name and Access" window, next to "Name", enter "MS02.tls1.local". 24. 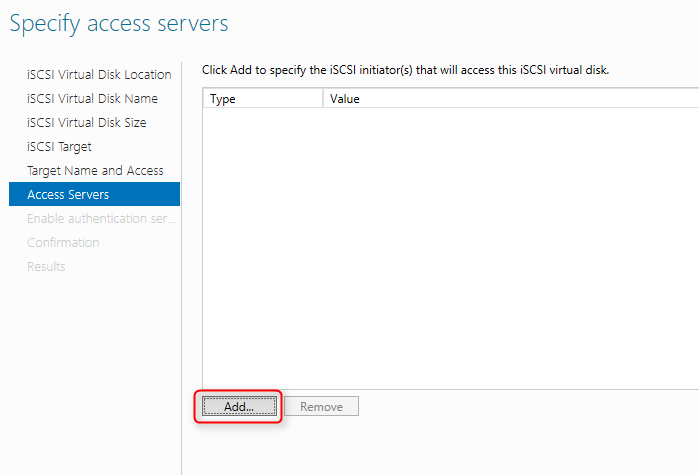 On "Access Servers" window, click "Add". 25. On "Add initiator ID" window, select "Enter a value for the selected type". 26. Next to "Type", select "IQN". 27. 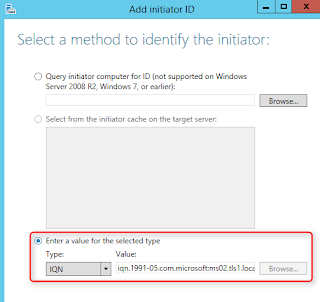 Next to "Value", enter "iqn.1991-05.com.microsoft:ms02.tls1.local" the iSCSI initiator of MS02. 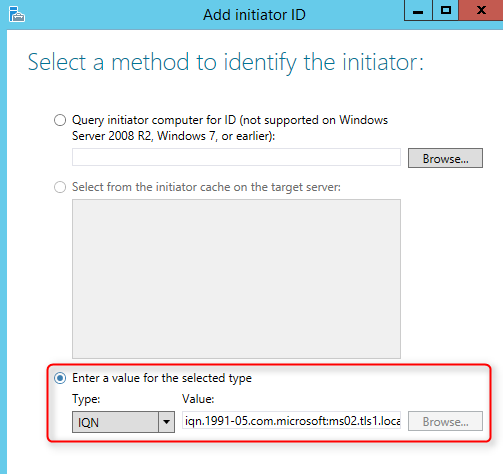 Remark: "iqn.1991-05.com.microsoft" is the default prefix of IQN of Microsoft iSCSI initiator. After entering the prefix, we need to enter the FQDN of the server. 29. On "Access Servers" window, click "Next". 30. On "Enable Authentication" window, click "Next". 31. On "Confirmation" window, click "Create". 32. On "Results" window, click "Close". 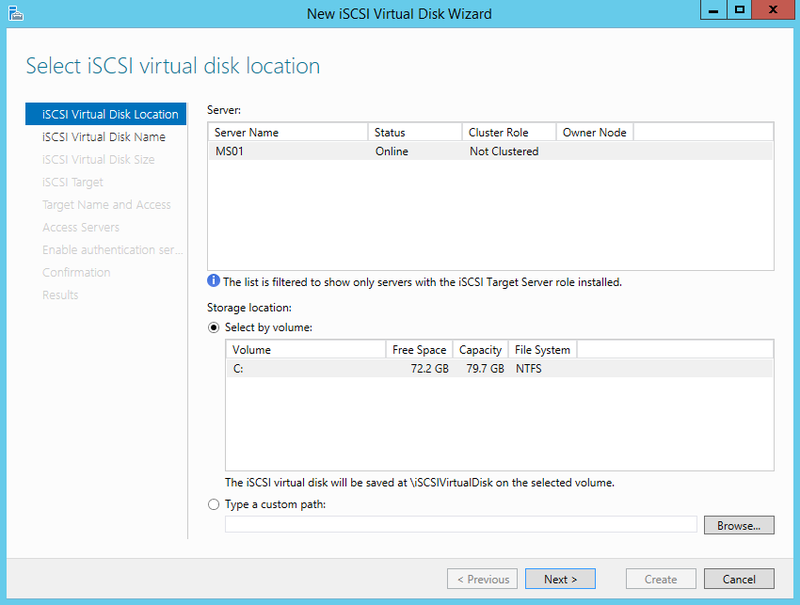 Now, iSCSI target with the virtual hard disk is ready. 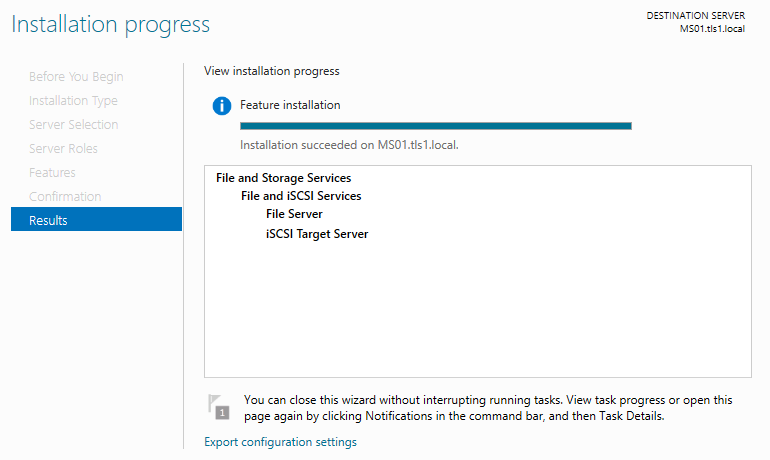 We will configure MPIO and iSCSI initiator in MS02 next part.